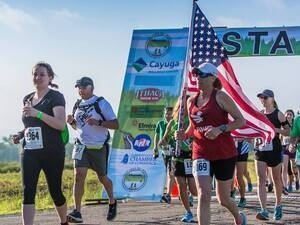 The Gorges Ithaca Half Marathon, presented by the Cayuga Medical Center, brings you a taste of gorges Ithaca. The new course will make use of the recently completed Black Diamond Trail, and will offer a fantastically fast and scenic half marathon! The first half runs gently downhill along the Black Diamond Trail, passes numerous waterfalls, and gives runners a unique view of Cayuga Lake.